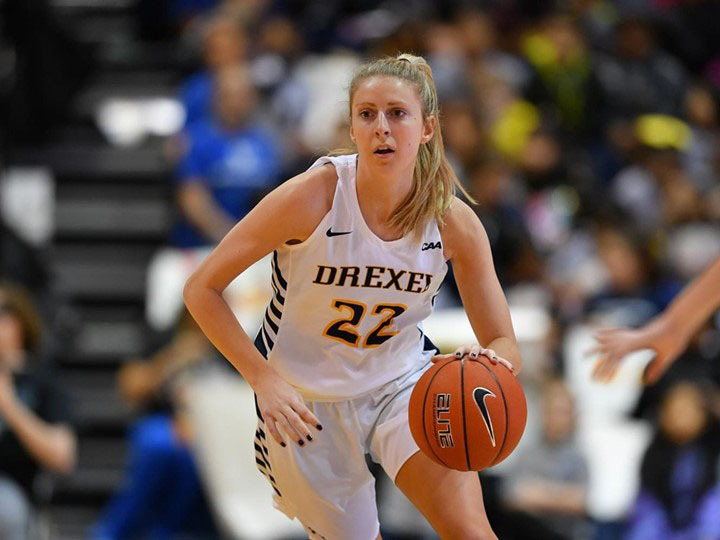 Freshman Maura Hendrixson posted a career-high 16 points as the Drexel University women’s basketball team picked up their first Colonial Athletic Association win of the season, defeating the University of Delaware Blue Hens Jan. 13, 57-40. The win was Drexel’s eighth straight against the Blue Hens and improves the team’s record to 9-5 on the season with a 1-2 mark in conference play. In Newark, Delaware, the Blue Hens got an early advantage thanks to Drexel turnovers. The Dragons turned the ball over three times early in the first quarter, which helped the Blue Hens establish a 6-2 lead. However a three from junior Aubree Brown sparked a 9-0 run for Drexel. Junior Bailey Greenberg hit a layup to give the Dragons the lead for the first time in the game. The nine unanswered points were capped off by driving bucket from sophomore guard Hannah Nihill and jumper by Maura Hendrixson. Delaware would get two points back on a layup by sophomore Lizzie O’Leary, but Drexel held the 11-8 advantage. Drexel’s top-ranked defense was a highlight in the second quarter, holding Delaware to only four points. The Dragons held the Blue Hens to just 2-13 shooting in the quarter, and 0-4 from beyond the arc. The Drexel offense wasn’t very potent in the quarter either, shooting 2-14 from the field, but the team was able to get to the free throw line. The Dragons sunk six free throws in the quarter to take a 21-12 lead into halftime. A Dragons’ offense that had sputtered the past few games came alive in the second half and it was largely due to Hendrixson. Hendrixson was effective due to her success from the three-point line, an area where Drexel has struggled recently. Hendrixson hit four threes and accumulated 14 points in the half. It was a breakout performance for Hendrixson, who only had three points on the season prior to the game. Hendrixson’s 16 points were a game-high and her career-high five steals were also the most in the contest. For her efforts, Hendrixson was named CAA Rookie of the Week. The Blue Hens were able to cut the Drexel lead to 10 in the third quarter on a three by junior Bailey Kargo. However, an 11-0 Drexel run would seal the game for the Dragons. On the run, Drexel hit three consecutive threes, two from Hendrixson and a corner three from Nihill. Brown was also strong for Drexel, posting a double-double, with 12 points and 10 rebounds. Brown also posted a game-high six assists. Kargo led the Blue Hens in scoring with 12 points, while graduate Makeda Nicholas led the game with 11 rebounds. Delaware was held to 17-56 (30.4 percent) shooting from the floor, with a 3-15 (20.0 percent) mark from three. Drexel shot 20-58 (34.5 percent) on the night, including 6-21 (28.6 percent) from beyond the arc. The Dragons will continue their road trip this weekend, traveling to Boston to take on the Northeastern University Huskies Jan. 18 at 7 p.m. Then they’ll square off with the Hofstra University Pride in Hempstead, New York, Jan. 20 at 2 p.m.